Cameron Boucher and his Sorority Noise cohorts make conflict and confusion something to rally around—it’s what they do. 2015’s Joy, Departed painfully dealt with addiction and depression, but it did it in a way that was identifiable, no matter how intensely personal it got. The “emo-revival” band’s new single “No Halo,” the first from their third LP You’re Not As ___ As You Think, does much of the same. Elided with a steady guitar and unobtrusive drum bounce, Boucher is flatly admitting, “I’m a mess,” and alternates between insomnia and oversleeping. At almost every turn in “No Halo,” he’s deeply introspective and seemingly self-critical. In the chorus, which ignites with guitar squall and communal shouting, Boucher relays, “I didn’t show up to your funeral, but I showed up to your house / I didn’t move a muscle, I was quiet as a mouse / And I swore I saw you in there, but I was looking at myself.” As if life itself weren’t enough to deal with, being reminded of its sinister companion is even worse. And the only way to slough it off is to accept it, but not give into it, which is exactly what Sorority Noise do here. You can listen to “No Halo” below and check out the tracklist for You’re Not As ___ As You Think which drops March 17 (St. Patrick’s Day) via Triple Crown. 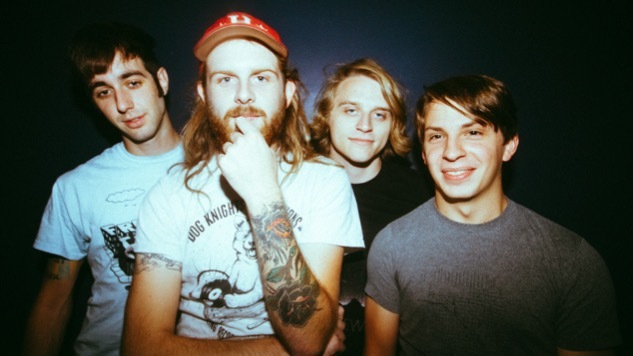 Sorority Noise also have upcoming tour dates with Modern Baseball and Kevin Devine, which you can find here. Finally, Sorority Noise did a 2015 Daytrotter Session that deserves a listen—that’s in the Paste Cloud player below.